RpWallMaker to create wide, thick 3D walls, edit them and cut holes in them. 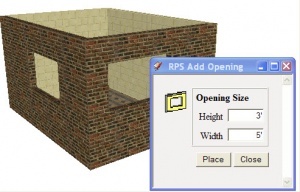 RpWallMaker Free is a free add-on for SketchUp (Windows or Mac) to create wide walls (3D walls with thickness), edit them and cut holes in them. The custom walls are generated by drawing the center line of the wall in SketchUp and the wide, 3D wall is automatically generated. 6.1 How do you make it close the last corner when you make a closed loop? 6.2 How do I clean up walls after changes? Proceed to Downloads Page to download a copy of RpWallMaker Free. After downloading the ZIP file, open it and click Click here to install RpWallMaker to install it. 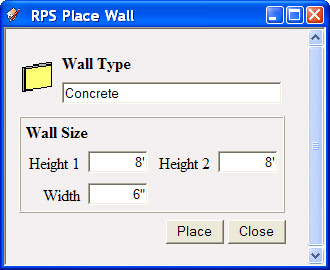 After Starting SketchUp, Select 'RpWallMaker from the SketchUp Plugins menu. The downloaded ZIP file to be extracted and placed in a folder called Plugins in the folder where SketchUp is installed. Click the first - Define and Place Wall - icon on the toolbar. Set width and heights as desired. Using the cursor select points for the center line of the wall. (You may use the VCB - Value Control Box) to enter exact lengths after starting the wall in the proper direction. (SketchUp will glue it properly to the outside face of the wall. The opening is cut through both faces of the wide wall. Click the second - Cut an Opening - icon on the toolbar. 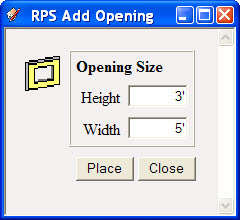 Set width and height of the opening as desired. Click Place and place the opening cursor on the wall. To edit a wall, right click on the wall and select 'Edit Wall. You can change the height or width of the wall. If you wand to change the end conditions (how the wall intersects with other walls), you will have to erase the wall and place it again. How do you make it close the last corner when you make a closed loop? Good point. We need to fix this, and also operate better when you start a new wall from the edge of an existing wall. Also, we should add a "draw 4 walls in a rectangle" feature. We will make some changes and put out a new version. How do I clean up walls after changes? I noticed something, when I edited the thickness of a wall, the other connected walls didn't adjust the corners to match the new thickness of the wall I changed. If you want wider walls, you need to set a wider thickness and remake the walls. In our "CAD" world, we spent a lot of time working on a feature to let the user design a house with 6" walls, and then convert it to 9" walls. It turned out that this wasn't really practical. Because of the questions like "Do you keep the inside dimensions of a room the same, and increase the size of the whole building", or "do you keep the exterior dimensions the same, and decrease the size of the interior rooms", or a combination of both. Or, If a door is 18" from the outside corner of the building, do you want to mode the door, because of the wider walls, to make room for the framing? It is a nice feature, but we decided that our users would almost never use it. The value here is to adjust individual walls, but you will have to stretch the other walls and put the room back together yourself. Note: The length of a wall is not one of the parameters. 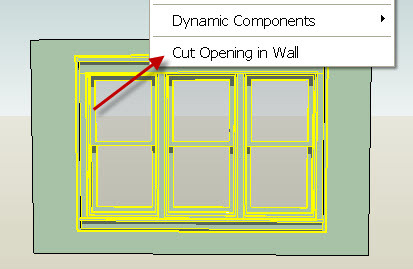 You can use SketchUp to stretch the wall group, and if will still redraw properly when you make other changes - width, height, or add an opening. Note also: You can use SketchUp to move an opening. It should work properly, so that when we remake the wall we find the new opening size and position, and re-cut it properly.